Summary: After the Night of Broken Glass, Oskar’s parents put him on a ship to America. His father’s last words to him are, “Even in bad times, people can be good. 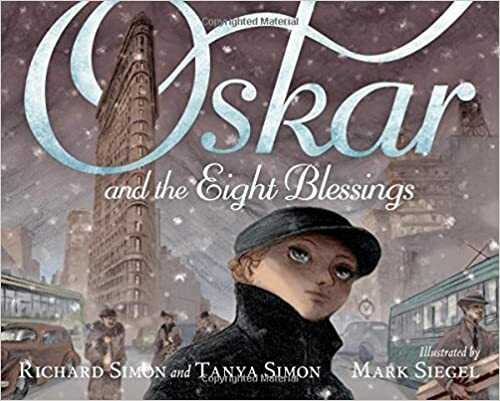 You have to look for the blessings.” Oskar arrives in New York City on the seventh day of Hanukkah, which is also Christmas Eve. He has to walk over one hundred blocks to find his Aunt Esther. As he walks, he looks for blessings. An old woman feeding pigeons gives him a loaf of bread to eat. A boy playing in the snow gives him a pair of mittens. And Eleanor Roosevelt herself gives him a few kind words. As night falls, and the Hanukkah candles begin to glow in windows, Oskar at last reaches his destination and finds a new home. Grades 1-3. Pros: A beautifully illustrated, moving story about finding good in the world during a bleak time in history. An author’s note explains that the events of Christmas Eve 1938 are historically accurate, including Eleanor Roosevelt’s visit to New York City. Cons: While very young children would enjoy this story, it does require at least a basic explanation of Nazi Germany and the beginning of the Holocaust. Looks like a wonderful book. Thanks for pointing it out! Happy Hanukkah! I really enjoy your reviews.